89 min., not rated (but equivalent of an R). 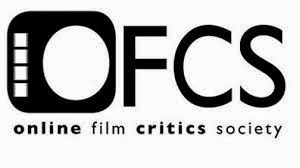 The genre anthology format has seen a resurgence in the art of short-form filmmaking, and luckily there have been more hits than misses. For every “Trick ‘r Treat,” “V/H/S,” “V/H/S 2” and “Tales of Halloween,” there is an “ABCs of Death,” “V/H/S Viral” and “A Christmas Horror Story.” Somewhere in the middle but more in the positive column stands “Southbound,” a five-segment horror omnibus that’s scrappy and skillfully conceived but still inherently hit-and-miss as these things go. Particularly impressive is how a new wave of cool, edgy, talented indie filmmakers—most of them having contributed to “V/H/S”—have combined their efforts in a thematically cohesive package with cleverly smooth transitions between each tale. If not every short-lived yarn has a memorable payoff, at least it’s momentarily entertaining and then bleeds into the next one in no time. In “Southbound,” the desolate, pentagram-shaped road often leads to nowhere but hellish pitstops. 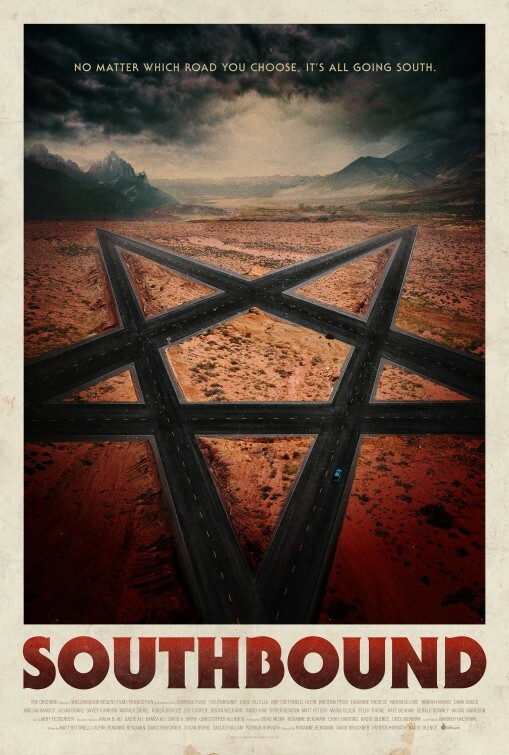 In the wraparound segment, “The Way Out” from Radio Silence (that filmmaking quartet from “V/H/S”), a blood-covered Jack (Matt Bettinelli-Olpin) and Mitch (Chad Villella) drive on down a desert stretch of road away from some sort of crime they committed but get caught in a nightmarish loop and can’t seem to rid themselves from a slew of flying Grim Reapers. This tone-setting taste for what’s to come certainly grabs one’s attention as an inescapable “Twilight Zone” episode in the scorching heat, making way for an unpredictable, tightly constructed tapestry. The second and third shorts are the most effective of the five. Writer-director Roxanne Benjamin’s freaky, uncomfortably amusing “Siren” begins the chain, finding a tour van full of girl bandmates Sadie (Fabianne Therese), Ava (Hannah Marks) and Kim (Nathalie Love) getting a flat tire in the middle of the desert. When a chipper couple, Betty (Susan Burke) and Raymond (Dana Gould), comes by and offers the girls a ride, Sadie is initially a little wary, while the other two accept. As a part of the couple’s kindness, they let the girls stay in a spare room and invite them to the dinner table for a “Sunday roast” with their neighbors. Something is off about the couple, the neighbors, and the roast. What happens next segues into “The Accident,” written and directed by David Bruckner (the impressively shot “Amateur Night” segment in “V/H/S”). Driving at night and distracted with talking on the phone to his wife, a man named Lucas (Mather Zickel) looks up at the road right before hitting one of the female survivors from “Siren.” Instead of running, the driver sees that the woman is severely injured with a limb hanging by a thread and quickly calls 911. The female dispatcher tells him to find the nearest hospital. Once Lucas finds the only hospital, it’s completely abandoned. With no one else to turn to except the voice in his ear, as well as an EMT on the line, the poor schmuck gets walked through a surgery that might save the woman’s life. Intense, brutal, engrossing and even mordantly humored, “The Accident” is easily the ghastly highlight. Unfortunately, writer-director Patrick Horvath and co-writer Dallas Hallam’s (2012’s “Entrance”) “Jailbreak” has to follow “The Accident,” and it’s the weakest link, hands down. Wielding a shotgun, Danny (David Yow) crashes into a seedy watering hole of questionable clientele in search of his long-lost younger sister (Tipper Newton), but he will find out the hard way that she was probably better off not being found. Lastly, the film circles back to the beginning with Radio Silence’s “The Way In,” a closing bookend to the opening “The Way Out,” in which a married couple (Gerald Downey, Kate Beahan) spends the night with their daughter (Hassie Harrison) at an Airbnb before she’s off to college. Once a trio of masked intruders come knocking to torment the family, this becomes a satisfying, efficiently executed shocker in a short burst, while featuring some of the creepiest masks since “The Strangers." Cumulatively twisted and seamlessly interwoven, “Southbound” certainly leaves you wanting more for a binge of horror quickies. Even if by definition that genre anthologies aren’t always consistent in quality, the film has a grubby drive-in style across the board and a solid analog-synth score composed by The Gifted. Moreover, the clearest throughline is that of travelers atoning for their sins and then being punished, thanks to Larry Fessenden’s guiding voice on the radio as “The D.J.,” and there’s enough connective tissue for the film to form a whole without ever feeling disjointed. All of the stories have their own unique, vicious allure that even the schlockiest one still can’t be called an outright stinker, and most of them are willing to be mysterious and not hand out clear answers or resolutions on a silver platter. Another horror anthology exploring a different regional landscape would not be out of the question down the road.